Here we selected and reviewed the best towels for backpacking and travelling. 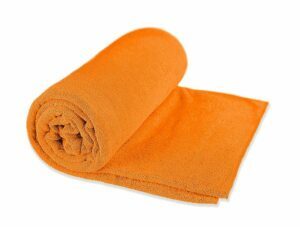 A regular towel is a bad choice for backpacking or travelling as regular towels are heavy, bulky and slow to dry. Therefore, they occasionally need to be packed moist/wet inside your backpack. This is not recommended because such moist environments are an ideal place for bacteria to thrive and breed. Furthermore, by squeezing a wet towel in your bag you are also risking that the bacteria will spread to other items (garments, food etc.). 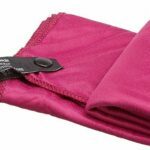 Travel and backpacking towels differ from regular towels by material. 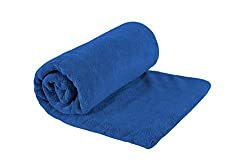 Regular towels are typically made of cotton which dries slowly while travel and backpacking towels are made of polyester and nylon microfibers. 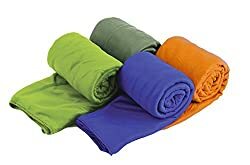 Therefore, they dry much faster than cotton towels and are also lighter and very compressible (usually they come with a stuff sack). However, they are slightly less water-absorbent than cotton towels and can feel synthetic to the touch. Nevertheless, they are the best option for travelers, backpackers, hikers and others who spend a lot of time on the move. 1. Buying a Towel for Travelling and Backpacking – What is important? The material influences the drying time, weight and packed size of a towel and is therefore very important. Travel and backpacking towels are made of polyester and nylon microfibers in order to be compressible, lightweight and quick drying. The fabric usually contains modified polyester and nylon fibers which trap the water in pockets between them (note that polyester and nylon fibers by themselves absorb very little moisture). Therefore, water can be squeezed out after use and the towel will dry very fast. Travel and backpacking towels are available in different sizes. Which size to choose depends on your personal preferences but keep in mind that large towels are heavier, bulkier (packed size) and dry slower than small towels. 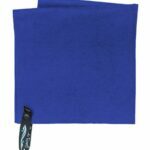 For backpacking and hiking trips we recommend a relatively small towel (18×36 in. or smaller) as possibilities for showering are usually limited on such trips. Lightweight equipment allows you to move faster and easier and thus towels for backpacking and travelling should be lightweight. Body towels for backpacking and travelling typically weigh around 4 oz. 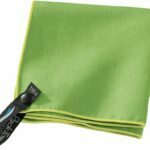 Some travel and backpacking towels utilize antimicrobial treatments such as Polygiene. Antimicrobial treatments inhibit the growth of odor-causing bacteria and thus such towels stay fresh for longer. However, note that antimicrobial treatments eventually get washed out – there is no such thing as a permanent antimicrobial treatment. Dimensions 10x14 in. (Face), 16.5x36 in. (Hand), 25x54 in. (Body), 36x59 in. (Beach) 16x32 in. (S), 20x40 in. (M), 24x48 in. (L), 30x60 in. (XL) 10x14 in. (Face), 16.5x36 in. (Hand), 25x54 in. (Body), 36x59 in. (Beach) 12x24 in. (XS), 16x32 in. (S), 20x40 in. (M), 24x48 in. (L), 30x60 in. (XL) 19x19 in. 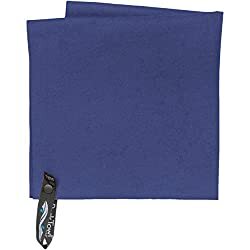 The PackTowl Ultralite towel is extremely light and thus perfect for hikers, backpackers and others who want to have super lightweight equipment for their challenging trips. The towel is made of a polyester/nylon fabric with a density of merely 100 g/m2. In comparison, most summer base layers have a higher fabric density (typically more than 130 g/m2).Nevertheless, the towel is very water absorbent – it absorbs up to four times of its own weight in moisture. Due to the thin fabric the towel can be also packed very small. It comes with a storage pouch with a loop so that you can easily attach it to a backpack or other gear in the rare case where the towel wouldn’t dry before you hit the road again. The towel is available in four different sizes and three different colors. 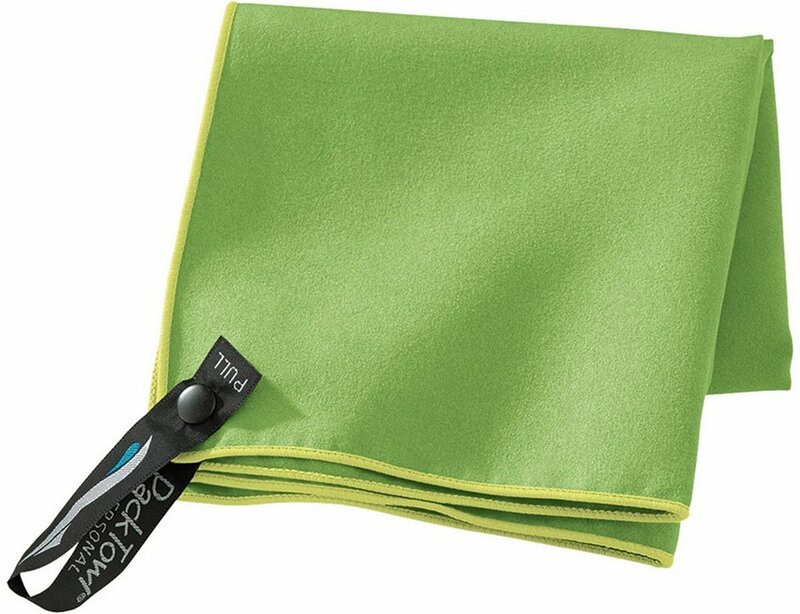 The Sea to Summit Pocket towel is heavier (fabric density of 190 g/m2) than the PackTowl Ultralite towel but on the other hand it also absorbs more water. Therefore, it is very popular among outdoor enthusiasts and travelers. 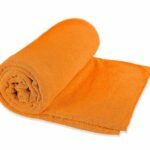 The towel is very soft and silky to the touch for increased comfort. It dries fast and comes with a zippered EVA case for easy storage. The Sea to Summit Pocket towel is available in four different sizes and six different colors (cobalt, eucalyptus, lime, berry, grey and orange). It is slightly less expensive than the above listed PackTowl Ultralite towel (at the time of posting). 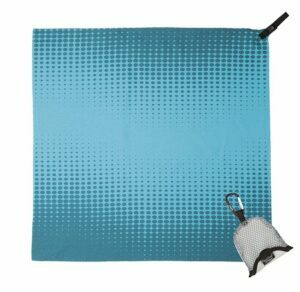 The PackTowl Personal towel has a fabric density similar to the Sea to Summit Pocket towel mentioned above. 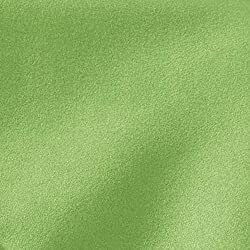 The fabric is soft and smooth to the touch and absorbs four times of its own weight in moisture. Therefore, the towel provides great comfort. The fabric is also treated with Polygiene in order to eliminate odor-causing bacteria. Polygiene uses silver salt (naturally present in water and soil) to safely eliminate the ability for bacteria and fungi to grow. Therefore, the towel stays fresh for longer without any harmful consequences for you or the nature. The towel is available in four different sizes and five different colors. It comes with a zippered pouch which has a loop so that you can easily attach it to a backpack. The Sea to Summit Tek towel is best for those who want a towel that dries faster than a regular cotton towel but provides similar comfort. 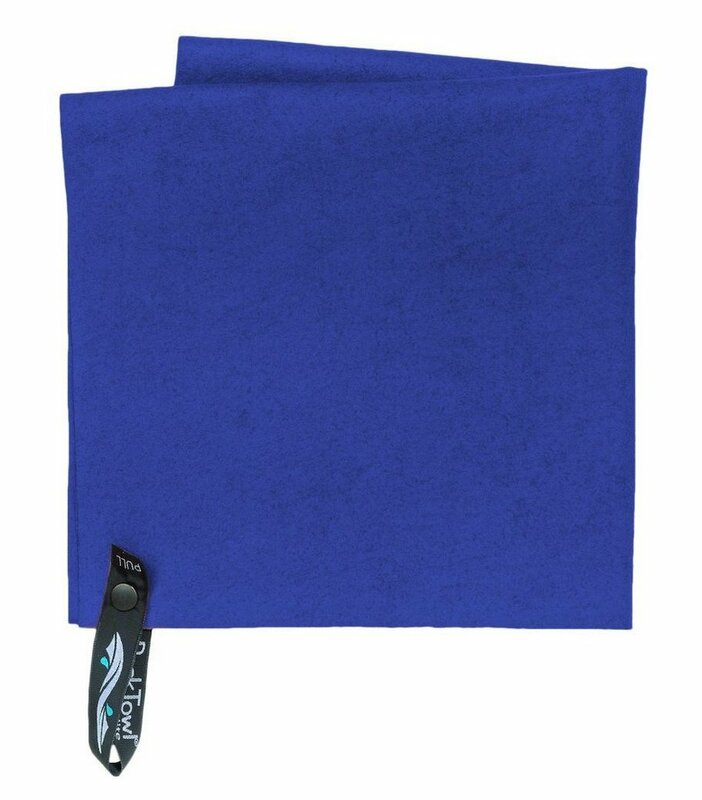 The Tek towel is extremely water absorbent and super comfortable to the touch. However, with the fabric density of 400g/m2 it is also the heaviest product in this review. As the fabric is fairly thick it also doesn’t pack as small as other towels listed here. The towel is available in five different sizes and seven different colors. It comes with a zippered mesh pouch. 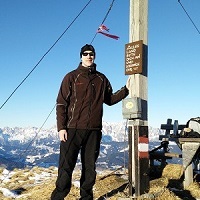 The PackTowl Nano towel is best for hikers and backpackers who regularly do trips away from the civilization (limited possibility for showering) and thus need a small and handy towel. 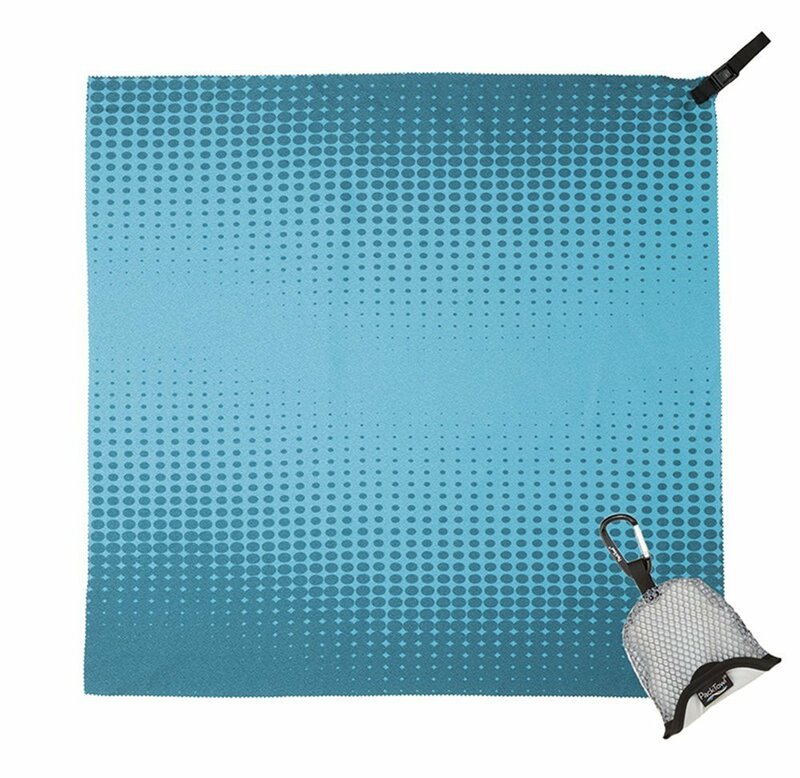 The PackTowl Nano towel is super light (it weighs merely 0.9 oz.) and comes only in one size (19×19 in.). The fabric absorbs up to two times of its own weight in moisture and is very soft to the touch. The towel can be also used as a headband to keep the sweat out of your eyes. It comes with mesh pouch and carabiner clip so that you can easily attach it to a backpack or other gear.